For every sling purchased, Rockin' Baby will donate a new sling to a Haitian mother, and educate her on its importance! Rockin’ Baby is a re-birth of www.rockinbabysling.com with a new business model and a new plan. Since 2002, Natasha and Lisa have created amazing products that demonstrate sophistication, fashion, and attention to a Mother’s most prize possession: her baby. Kathryn Wiley is purchasing the website and company in efforts to breathe life back into an already successful product. 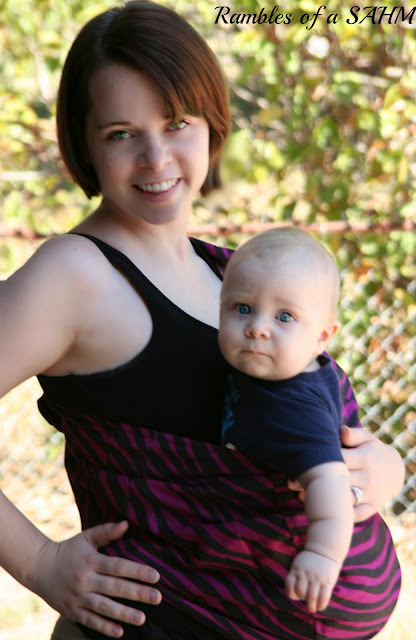 Rockin’ Baby sells wonderfully elegant baby slings and pouches. The slings and pouches consist of 6 yards of unique, modern textiles to make a mother feel beautiful and more like herself. As of January 1, 2011, Rockin’ Baby changed the business model, not the product, drastically. Rather than just being chic, Rockin’ Baby is now SOCIAL CHIC. The social aspect of the new Rockin’ Baby will be two pronged: Mother to Child and Mother to Mother. First I have to say that I love a company who not only provides the consumer with a fantastic product but also gives back to a community. This is why I love Rockin’ Baby Slings. They make trendy slings and pouches for a reasonable price. The pouch I received is reversible and it has zippers that make it easy to adjust to your size. I really like the zipper feature since a baby grows so quickly. I also like the fact that it has two different prints making it easy to match your outfit. The fabric is soft but thick, similar to canvas, which holds up to a heavy baby. I really like how easy it is to use and it’s small enough to fit inside my diaper bag. I am usually not a fan of pouches since I have big babies that grow out of them quickly. Rockin’ Baby has solved this issue with the adjustable zippers! You can purchase slings or pouches at rockinbabysling.com. Also when you do purchase one an orange sling will be given to a Haitian mother. I love the idea of getting a Rockin Baby Sling for a new mother as a baby shower gift and then being able to tell her about a Haitian mother getting one too! I highly recommend Rockin’ Baby Slings.